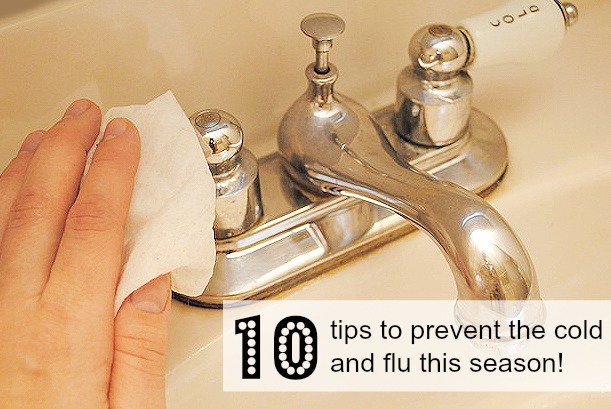 10 Tips to prevent the cold and flu in your home this season! With this year’s cold and flu outbreak, it is more important than ever to safe guard your family from these illnesses. I’ve come up with a few super easy tips to help protect your family this and every cold and flu season. Vaccinate – I know that vaccines are totally a personal choice, however, vaccinating you and your family is the easiest way to prevent the seasonal flu in your home. Most drug stores will do them without an appointment or your family doctor will be happy to give you info regarding the vaccines. Wash hands frequently: Use an antibacterial soap and warm water and wash your hands for 20-30 seconds. I also keep hand sanitizer in a few areas in my home for quick washes. Disinfect germ hotspots: Door knobs, light switches, cupboard handles and pulls, remote controls, faucets, etc are hot spots for germs to accumulate. I love to use Clorox¨ Clean up Cleaner with Bleach and a few paper towels. If you have a cough, do the “elbow cough”. Teach your little ones to cough into their elbow as to keep hands as clean and germ free as possible. Eat right! No brainer right? Put only good foods into your body so your immune system stays ready to fight! Drink plenty of water. 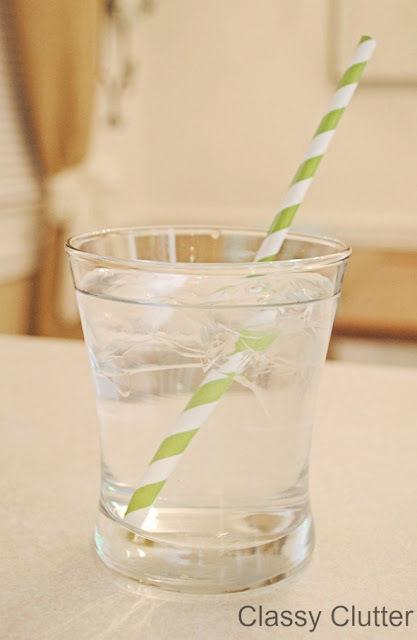 While this is always a good idea, staying hydrated is super important for your body to stay strong. Drink even more if you’re feeling under the weather! Exercise – Exercise is always a good way to keep you body healthy and ready to battle any illnesses that may come your way. Avoid touching your eyes, nose and mouth as these are pathways that can put harmful germs right into your system! Touching your eyes, nose and mouth with germy hands is one of the fastest ways to spread germs! YUCK! For the kiddos, disinfect toys and play items frequently. Germs that cause the flu can stay alive and active for up to 72 hours on most surfaces! I like to use Clorox Disinfecting Wipes on toys and play areas. Some toys are even dishwasher safe which is another way to disinfect them. Disinfect your car – Let’s face it. Tons of germs are coming in and out of your car on a daily basis. I keep Clorox Disinfecting Wipes in my car and I wipe down my steering wheel, door handles, seat buckles, etc whenever I’m thinking about it. If you’re pumping gas, that may be a good time to do a quick wipe down. Which are your favorite Clorox cleaning products that help keep you and your family healthy? Leave us a comment for a chance to win a $1,000 Visa Gift Card! d. For those with no Twitter or blog, read the official rules to learn about an alternate form of entry. Be sure to visit the sponsor’s brand page on BlogHer.com where you can read other bloggers’ reviews and find more chances to win! Visit Clorox.com to learn more about the importance of disinfecting and other tips for keeping you and your family happy and healthy. Love the clorox cleaning wipes! Easy and quick to use! I love the easy simplicity of their Greenworks cleaning wipes. Like you – I try to keep them in the car to wipe down for germs and at home for quick wipedowns of doorknobs, countertops, & such. I use clorox wipes everyday in my home! LOVE ‘EM! I love clorox cleaning wipes for quick pick-ups. I also love to use clorox bleach on the clothes (undies) that can be bleached in combination with my sanitary cycle on the washer- germies don’t stand a chance there! I use the disinfecting wipes all over the house where ever I think germs might be hiding. I also use the toilet bowl cleaner – it does a better job of cleaning than others I have tried. Thanks for the giveaway. I like the clorox disinfecting spray. The wipes are really convenient, but they’re a little too saturated for when I do a basic wipe-down of the house or office at work. We use the disinfecting wipes and the toilet bowl cleaner. My favorite is clorox disinfecting wipes! I use them in the bathroom and the kitchen. I forget to wipe down the car! Thanks for the reminder. I’m a self proclaimed germaphobe! I follow each of your tips! I keep the Lysol Kitchen Antibacterial spray on my kitchen counter and wipe down the counters several times a day. Love it!! I’m a fan of the Clorox wipes. Portable. Disposable. Perfection. I became a faithful fan of Clorox wipes when I was a nursery school teacher. I wiped the door knobs, tables, and toys to prevent spreading colds in my classroom. Now I use it at home. I love Clorox wipes and Clorox all purpose cleaner! Enjoyed reading your tips! Thanks for the giveaway chance! I love the wipes! So quick and easy. Thanks for the great tips! I use plain old bleach and water in my cleaning arsenal. I love the wipes ! I use the toilet cleaner and the liquid in my wash. I use Clorox wipes everyday and keep them in every room. A must-have with me. We like the bathroom and toilet bowl cleaners, but I’d like to try the wipes too. I love the idea to keep the wipes in the car! Great tips and GREAT giveaway with the Visa gift card!! I keep Clorox wipes under every sink in the house! i like the bathroom and toilet cleaner for keeping my family safe from germs! I am all about the wipes. They are portable and can be kept in all different parts of the house as I have some in the bathrooms, Kitchen and garage. we use clorox wipes pretty much every day! they are great and so easy to use! I love the wipes too, but I use more clorox liquid than the wipes. I use it in the laundry, mixed with water for counter tops, floors, doorknobs, toilets, and pretty much everywhere germs are!! Clorox wipes are what I use most. I love all the Clorox products, but what we use most often (everyday in fact) are the Clorox Disinfecting Wipes. I keep 1 container in my kitchen and 1 in my son’s bathroom. Makes it so easy to keep our house clean and germ free. Also, as a mom I love that he can help clean his own bathroom. That’s priceless! We like the Clorox® Toilet Bowl Cleaner and Clorox Anywhere® Hard Surface™ Daily Sanitizing Spray. I like and use the Clorox Disinfecting Bathroom Cleaner. Having a toddler, I am constantly wiping everything down with Clorox wipes! I love them! Clorox FreshCare Towels are the best to use to clean with. I have always used the Clorox toilet bowl cleaner! Easy and ready to go! I love the wipes for quick clean ups &wipe downs. Also love just plain clorox diluted for heavy duty cleaning when a bug breaks out. Gotta keep a house clean for the kids! i love the wipes,so easy and handy! Clorox disinfecting wipes and Clorox floor cleaners are my favorite products. The wipes are handy for quick cleanups and wiping down door knobs, computer keyboards, phones, etc….the little cleaning jobs that help keep you healthy.When I use the floor cleaner, I feel more confident about allowing my little one to play on the floor. I also like to sanitize toys with a bleach-water solution. The wipes are easy to use, but I still swear by plain old clorox …. it is so inexpensive, and does the job! I believe the best way to stay healthy is to keep your immune system strong. I take echinacea twice a day. what’s that saying about an ounce of prevention? Great tip on cleaning the car… I never really gave it a second thought! Love the wipes, especially for things like light switches, remotes, the steering wheels and door handles in our cars and all of our charging devices that get handled every day. I use plain Clorox bleach to kill germs in my bathroom and kitchen. It’s great for killing mildew in my damp shower, too! The Clorox disinfecting wipes are perfect for our family of kids, makes toy cleaning really simple. The Lemon Fresh scent is my favorite! I love clorox wipes. There handy and great. I can’t live without the Clorox Disinfecting Wipes! Clorox disinfecting wipes and Clorox bleach are my favorite products to keep the house clean and my family healthy. The wipes, of course – they’re so convenient! I use the clorox wipes all the time…very easy. I also use clorox bleach and water in a spray bottle for disinfecting toys. I love the clorox disinfecting wipe, I use them all over the house. My kids get fingerprints on everything. I love that they clean and disinfect too. We love the Clorox wipes. Nice and easy! We use clorox wipes ti disinfect germ hotspots too, in addition to those you listed we also clean keyboard and mouse since we use them so much. We also use clorox spray to clean large counters. I like the clorox disinfecting spray. I am a huge fan of the Clorox Disinfecting Wipes. I actually just used some this morning. I love their wipes but I use it all. I like the wipes the best. 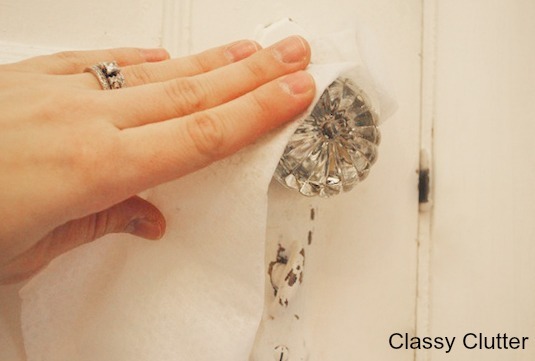 You can clean up so easily with a few of those in the house. 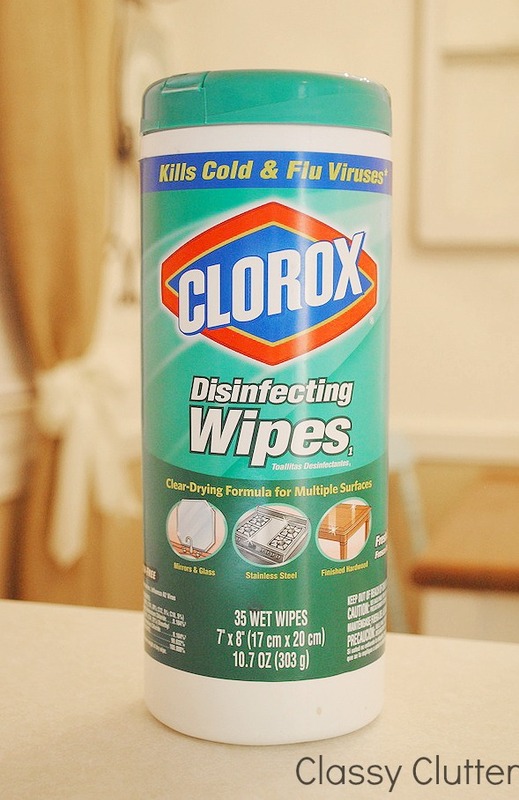 I love the Clorox wipes and spray, which are both convenient and great to have on hand! I use them both pretty much on a daily basis to reduce germs! Thanks! I love your great tips on staying healthy. My favorite Clorox products are the spray and wipe. Easy to use and very effective. I use the clorox bleach. I use both the Clorox bleach and the Clorox wipes. I keep a small baggie in my purse with at least 5 wipes all the time. When I go to the grocer, I can wipe off the handle of the cart. I feel much better about using them then. The product that keeps us healthy is Clorox Disinfecting Wipes. I like the Clorox Clean Up with Bleach spray – only thing I use to keep my kitchen tile and grout clean and germ free. The toilet bowl cleaner with bleach is a must have when you live with 3 boys!! My favorite is the Clorox All purpose I can use on anything. I use the bleach to give my bathtub a deep clean! Clorox Wipes at work and at home! I love using Clorox clean up for the kitchen and bathroom and Clorox wipes. We even keep Clorox Disinfecting wipes in the car for our hands. Love the Clorox wipes. They are especially handy for keeping things clean at my desk at work. Clorox wipes are the most convenient product but I also love to use Clorox bleach when I launder towels. It’s especially important to me to have the cleanest towels possible. My fave is Clorox Cleanup – miracle stuff. I personally feel like the bathroom is the nastiest place with the most germs, so I love using their Green Works toilet cleaner! Love Chlorox! My lil baby is always picking up germs at daycare and so is constantly sick, has been that way since he was 4 months old, so def love the wipes to help get the germs! Love Chlorox wipes! I use them at home and in my classroom twice a day! I use Clorox disinfecting wipes every day.